This story was originally published on The Grid's website on May 7, 2013. Advertisement showing Consumers Gas Station A complex. Toronto's 100 Years by Jesse Edgar Middleton (Toronto: City of Toronto, 1934). For Consumers Gas, permission from the province in 1879 to produce gas for heating, appliance fuel, and industrial uses couldn’t have come at a better time. Its main business—providing gas extracted from coal for lamplighters to brighten the city’s street-lighting system—would soon be swept away by electricity. 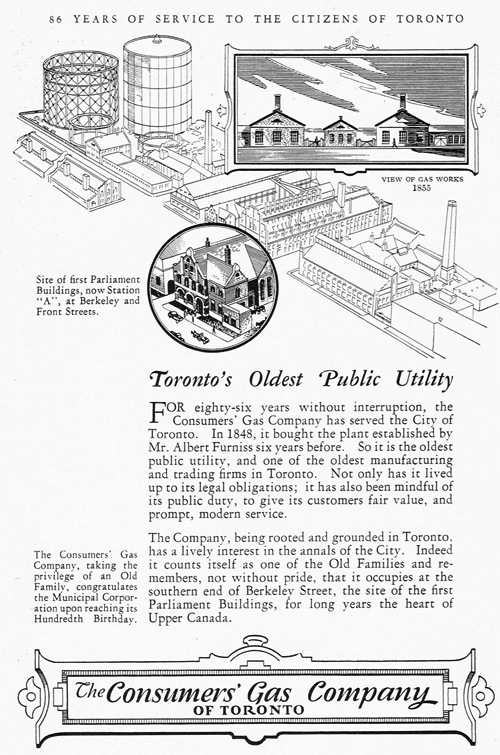 The resulting demand from businesses and homes for the fuel produced in its gasworks at Front and Parliament Streets, especially from areas recently annexed to Toronto, led to the company’s rapid expansion during the 1880s. Photo by Ellis Wiley. City of Toronto Archives, File 124, File 3, Item 38. The building processed gas until natural gas pipelines were connected to Toronto in the mid-1950s. Along with sites that eventually became 51 Division and Canadian Stage’s Berkeley Street Theatre, the purifying house was one of very few parts of Station A to remain physically intact. 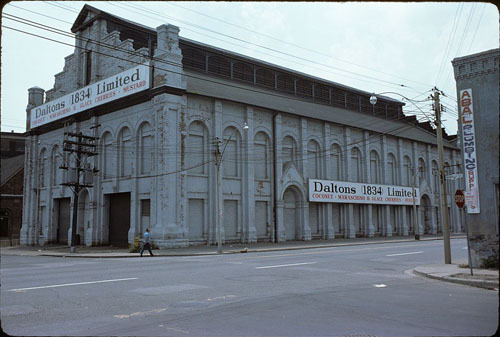 Food manufacturer Dalton’s purchased the site in 1967, expanding its operations from the neighbouring building, a former woollen mill built in 1882 which Old City Hall architect E.J. Lennox reputedly had a hand in. Dalton’s specialized in maraschino cherries, pleasing cocktail drinkers and dessert lovers across the city. The combined structures became known as the Dalton Building. The site was purchased in early 1984 by the Canadian Opera Company for offices, workshops, and rehearsal space. It would be the COC’s first permanent home—the company had relied on rentals around the city. Plans also called for a 400-seat performance venue to supplement the COC’s ongoing effort to build a permanent home, a quest which lasted until the Four Seasons Centre opened in 2006. Extensive renovations were boosted by a $1 million donation from the Tanenbaum family, which resulted in the facility being named the Joey and Toby Tanenbaum Opera Centre. The complex opened in stages over three years. 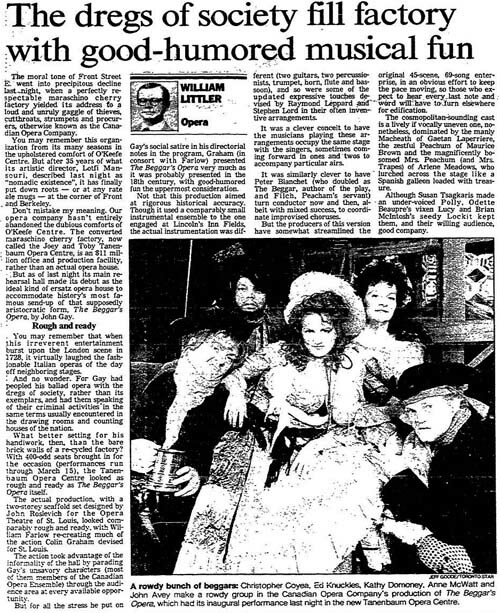 Toronto Star, February 27, 1986. The performance space, later known as the Imperial Oil Opera Theatre, opened with The Beggar’s Opera on February 26, 1986. “The moral tone of Front Street E. went into precipitous decline last night,” Star critic William Littler cheekily opened his review, “when a perfectly respectable maraschino cherry factory yielded its address to a loud and unruly gaggle of thieves, cutthroats, strumpers, and procurers, otherwise known as the Canadian Opera Company.” Littler felt the space was “the ideal kind of ersatz opera house to accommodate history’s most famous send-up of that supposedly aristocratic form.” The moral tone of the area never recovered, to the delight of those who have toured the facilities or caught a performance there. Additional material from A Tradition of Service: The Story of Consumers Gas (Toronto: Consumers Gas, 1993), Toronto Architecture: A City Guide by Patricia McHugh (Toronto: McClelland and Stewart, 1989), and the November 11, 1984 and February 27, 1986 editions of the Toronto Star.